High school graduation and college access are critical vehicles for individuals' social mobility and for community change. 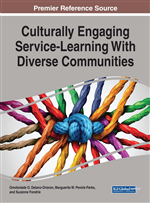 This chapter provides an overview of Lawrence2College, a culturally engaging service-learning partnership which was initiated in 2014 and focuses on these issues. Lawrence2College facilitates high school achievement and college awareness through a mentoring and support program which connects students from Lawrence High School, a public school in Lawrence, Massachusetts, with graduate and undergraduate students from Merrimack College, a private, Catholic college in neighboring North Andover. Lawrence is a city in Massachusetts with a strong Latinx presence, including recent immigrants. Poverty and low literacy are challenges faced by residents. This chapter explains the rationale and conceptual underpinnings of Lawrence2College and describes its evolution and approaches. The chapter concludes with insights and recommendations for practice and research. Educational access and attainment are critical to a democracy (Laguardia & Pearl, 2009), to the economy (Rouse, 2007), and to the pursuit of a just and equitable society (Brennan & Naidoo, 2008). This chapter will provide an overview of Lawrence2College, a service-learning partnership initiated in 2014 which connects youth from Lawrence High School with students from Merrimack College for mentoring and support focused on high school success and college awareness. Lawrence High School is the sole public secondary school in Lawrence, Massachusetts, a city situated north of Boston in the Merrimack Valley. Lawrence has a high level of poverty, high numbers of immigrants, and a large Latinx population (U.S. Census Bureau, 2010, 2015). Merrimack College is a Catholic college in North Andover, Lawrence’s neighboring suburb. According to the National Center for Education Statistics (2015), 72% of students at Merrimack College identified themselves as White while just five percent identified as Latinx and 12% did not to disclose their race or ethnicity (National Center for Education Statistics, 2015). A regional college, 67% of Merrimack College students are considered in-state residents. Less than a quarter of Merrimack College students receive Pell grants (National Center for Education Statistics, 2015), which are federal scholarships awarded to students from (low-income) working families. Many students come to Merrimack College with negative perceptions about Lawrence. This is largely a consequence of the cycle of socialization into racism, classism, and other forms of oppression (Harro, 2013) that is prevalent in American society and locally, in communities such as Lawrence and North Andover. Atkinson’s (2012) article, “Lawrence, MA: City of the Damned,” published in Boston Magazine, identified Lawrence as the poorest city in Massachusetts with the worst public school system in the state and pointed to problems such as high unemployment rates and increases in violent crime. The article was upsetting and unsettling to residents of the city. This is an example of media framing a city from a deficit perspective, thereby reinforcing existing negative stereotypes. It is disempowering for community members as the media hold the power to use data to reaffirm stereotypes. Deficit models are a disservice to individuals and communities and can lead to a self-fulfilling prophesy syndrome. Harry & Klingner (2007) discussed this common problem in their article about the disproportionate number of students of color in special education. Green (2006) raised similar concerns about the impact of the deficit model when applied to low-income, first-generation college students. Walsh, Hewson, Shier, and Morales (2008) raised concerns that media coverage of their youth initiative overemphasized negative stereotypes and may have consequentially reaffirmed stigmas pertinent to the community. Deficit models are debilitating as they advance internalized oppression whereby those who are oppressed view themselves as innately inferior. Community Engagement (CE) graduate students who work and/or live in Lawrence attest that they have witnessed residents who are stunted by internalized oppression caused by the negative stereotypes frequently applied to the city. Statements like, “Well, it’s Lawrence, what do you expect?” are not uncommon responses to instances of negative occurrences in the city. Lawrence2College operates from a strength-based perspective. Strength-based programs utilize the assets of students, families, schools, and communities to promote empowering environments (Bryan & Henry, 2008). Practitioners developed strength-based programming in response to the power imbalance between community-based professionals and the communities they service (Nelson, Prilleltensky, & MacGillivary, 2001). By building solidarity with youth, families, and communities, youth programs can create empowering environments for youth to thrive and reach their full potential.